Lex Luthor breaks from his press conference to watch a live video of Superman talking to Lois Lane on the Daily Planet rooftop (which I believe was the roof of 1938 Sullivan at the end of last issue, but these things happen). He watches them kiss and finally realizes that Superman is really Clark Kent and that his greatest enemy is married to the only woman in Metropolis Lex actually cares for. And worse, he and Brainiac have just ensured that Superman's powers are going to continue to go wonky while he hurts the people around him. Luthor makes an unscheduled call to Brainiac to tell him they have to abandon the plan that will destroy Superman because Lois will get hurt, but Brainiac informs him that it's already too late and that everything is already past the point of no return. Batman investigates the brash of new metahuman activity in Metropolis, noting that Jimmy Olsen has turned into a shapeshifter and Perry White has freezing powers. His main concern is the home of Daily Planet cafeteria worker Marge Svensen who appears to have developed super strength and invulnerability and used it to kill her husband, as we saw two issues ago. Batman believes that Brainiac is testing humankind by seeing what these powers will do to change people's behavior for better or worse. As he drives away in his Batmobile, he takes a call from Superman who chides him for not saying anything about Lois's recent metamorphosis, but Batman explains that he wanted to give Lois a chance to tell him first. The next day, Lois submits herself to testing with Dr. Kim at S.T.A.R. Labs. He tells her that little is really known about meta-human abilities and he's not positive how to help her. But he admits he sometimes has to accept help from morally suspect people, such as ... Lex Luthor. When he comes out from hiding, Lois immediately threatens Luthor with her new electric powers, but Lex assures her that he did everything in his power to save her and the Daily Planet building. He lies that they're both on the same side in this fight. Luthor shows off that he may be the only one who can really help her anyway and that he'll extend that aid to the rest of the affected Daily Planet staff as well. "Ms. Lane" calmly puts on her coat, tells Lex to go to hell and fires Dr. Kim while ambling out to meet her husband for a lunch date. Later at a Waynetech Research Division, Dr. Magnus asks Batman to be sure to thank Mr. Wayne for the use of his state of the art laboratory. They, along with Mr. Terrific and The Atom put Superman into an advance MRI machine to look more closely at how he's being affected by Brainiac's special exobyte. 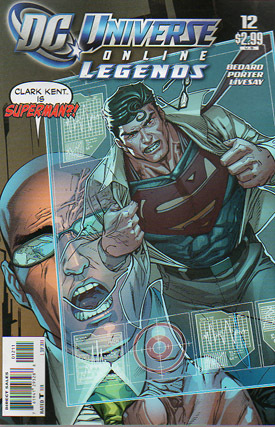 Soon, Superman hears screaming and sirens, so he breaks himself out of the scanner. When everyone tries to calm him down, he envisions them as villains trying to trick him and CLAPS his hands together, knocking them down with sheer air pressure before he flies through the wall and away. Batman calls in reinforcements and Superman soon meets up with Green Lanterns Hal Jordan and Alan Scott, as well as Firestorm and Captain Marvel. Again, Superman sees them as villains and attacks. The Green Lanterns order him to stop and beg that they don't make them hurt him, but Superman replies, "Go ahead. Do your worst." When I first saw the opening video for this game that told the story in the future with the big final battle between the heroes and the villains, I saw that Superman seemed to have exiled himself in space right near the Sun where he'd be powered enough to survive and basically spend eternity with his sadness. The obvious deduction is that sometime between the present and this future that Lois Lane had died. I don't usually make predictions about how a story will turn out when I'm that early into it, but when there's a lot of time until I see or read the next part, I end up having some time to think about my expectations. So my first expectation was that Lois would die, which hasn't happened yet, but I still think it's going to be as a direct result of Luthor and Brainiac's plans. At this point, I'm also guessing that Lois will die at Superman's hand. I also had the thought that Luthor had feelings for Lois, which was bolstered in my mind when future Luthor blamed Brainiac for thus far unmentioned personal injury. Although I did wonder when that big hunk of the Watchtower fell out of the sky on Lex and he was disfigured that we had hit that moment. But when Luthor finally admitted his feelings for Lois at the start of this issue, it all fell into place. The next issue will be the official half-way point of the 26 planned for the series, and I believe some of the broader strokes have been revealed to those who have been paying close attention, or at least following along with the Superman Homepage Mild Mannered Reviews. Art - 2: I may have finally figured out what I don't like at this art team. I have a couple of problems with the pencils like how characters' mouths look or that there are too many lines on some of their faces. But then the inking just exacerbates it. I'm NOT saying either artist is bad, but I don't think they're well-suited as a team. At least not yet. Cover Art - 1: All the problems I had with the interiors are magnified on this cover. Superman has the overused "red glowing eyes" to show he's angry so his heat vision is welling up. Then Superman's body is partly transparent on a view screen, so Luthor's newly scarred forehead is showing through where I have to look really closely to tell which of the thick lines belong with which character. The whole thing's a mess.